The challenge for September is to prepare a dish that includes both cheese and fruit. Sarah suggested a German recipe…. well, after scouring recipe books, picking people’s brains and searching online, I decided there are no typical German dishes where cheese and fruit are combined…. except perhaps cheesecake? So that’s the direction I went, although my recipe is certainly not a German one, coming from David Lebovitz: an American living in Paris! Melt butter and add chocolate. Stir on a low heat unil chocolate melts too. Add sugar, then eggs. Mix in flour, cocoa powder, salt and vanilla extract. Finally stir in chocolate chips. Pour into prepared tin and smooth out. Whisk together cheesecake ingredients and put dollops over top of brownie batter. Gently swirl in a little, but don’t overdo it! Bake for 35-40 minutes until just set in the centre. Leave to cool completely before removing from tin and slicing. Makes 9 pieces. Place berries, sugar and a dash of water in a pan and heat gently. Let simmer until fruit has collapsed, stirring now and then. Strain. Mix cornflour with a little cold water to make a paste. Return puree to the pan and add cornflour, whisking constantly while bringing back to a simmer. Strain again and leave to cool. If a skin forms you can either stir it in or remove it. 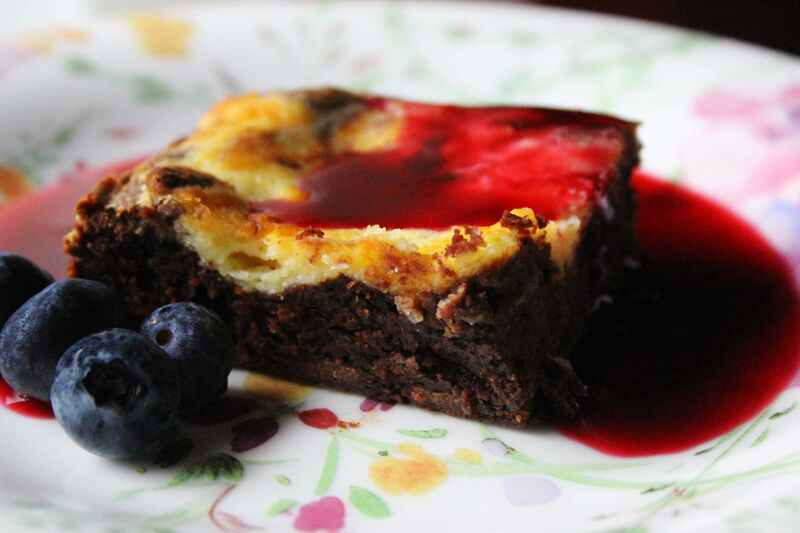 Serve the brownies in a pool of coulis. I added a white chocolate mousse and some fresh berries for decoration. 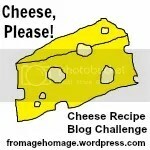 I hope this hasn’t bent the rules too far, but there IS both fruit and cheese in this recipe! You will be able to see a round-up of all the entries on Sarah’s site soon… in fact there is even still time to take part! This entry was posted in Food, Recipes, Vegetarianism and tagged Food, Recipes, Vegetarian. Bookmark the permalink. My son’s favorite dessert is cheesecake! I’ll have to make this scrumptious recipe for him! It’s so delicious Deb. He’ll love it! You can’t go wrong with David Lebovitz recipes. 🙂 Enjoy! I can never resist a cheese cake. This one looks divine. Oh my god, WHAT a recipe! Thanks for joining in Cathy. And with such a fabulous recipe… I think you should get extra points for adding chocolate to the cheese and fruit theme. Really looking forward to trying your recipe! Oh my goodness that looks delicious. Your photos are wonderful, Cathy. Thank you Alys – it’s fun doing these “challenges” now and then, and luckily I got inspired for this one! 🙂 Have a great weekend! I wish I could convince someone to whip up a batch for me! Ah. Few things I love more than cheesecake and berries. Though i love NY-style cheesecake best. I have to admit it sounds just a bit too rich for me, I love cheesecake and I love brownies but together – I’m not sure. Also I wondered why you put cornflour in your coulis? I will try your brownie recipe as I haven’t found the definitive one yet. BTW, I got email notification that you’d posted your butterfly diary but the link doesn’t work. Whoops! I hit the publish button by mistake while starting to write my intro – luckily I could delete it immediately! I’ll be posting it next week. This looks yummie as usual, Cathy, and as we’re approaching the season for comfort food I shall put it aside to try. With all the quinces I’m still in late summer mode! I wonder what you do with your quinces Annette? Do you make jam? I haven’t had any quince jam since I was a child! Your photos make this look irresistible. Can’t wait to try this–comes just in time for an upcoming potluck. Happy Weekend! Sorry, it’s all gone Barbara! 😉 I am probably going to make one again soon though, as it was so good and decadent too! 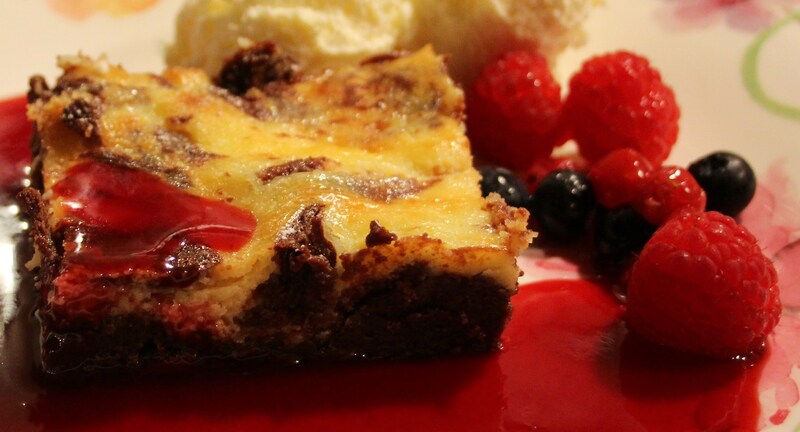 Wow cheese cake and brownies in one, mind blowing and innovative recipe. ..
You really should put together a recipe book Cathy…such incredible ideas. Another yummy one here. These look marvelous! Saving the recipe. Hope you enjoy it as much as we did! Thanks for all your comments Kimberley!